Please call owner Sid at 570-709-2565. Boat Location: Harveys Lake, Pennsylvania. Very good condition. 1800 shoal draft with recessed centerboard. Draft is 2'10" and 6' with board down. Comes with custom trailer with very low miles. Trailer has a mast raising system. Engine has electric start with cockpit controls. Newer 130 furling head sail. Dual battery charging system with shore power capabilities. Dual battery switch in main cabin. 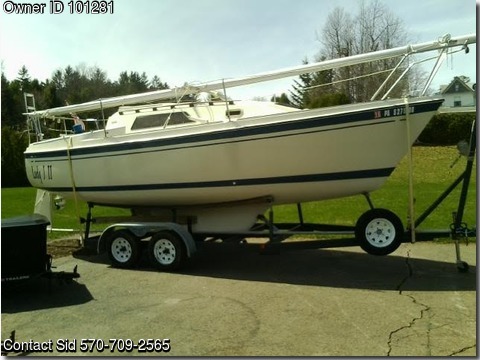 Marine VHF radio, depth sounder, teak swing ladder with extensions, upgraded self tailing winches, ss rail grill, whisker pole, cockpit cushions, new halyards and working lines, porti-potti, boom tent, life jacket, 6 gallon tanks and other misc items.